The following is a list of questions that we often hear. Please click on the question for an answer. If your question is not here, please feel free to contact us at 713-785-4922. Innovative Surveillance Solutions, Inc. (ISS) specializes in permanent and temporary off-duty peace officers, regularly providing coverage for merchants, seasonal events with high traffic, high-risk/high-profile locations, workplace violence threats, and many other security needs. For more information visit www.iss-inc.us or call 866-960-0159. To find out more, visit a Chamber Orientation on the First Wednesday of each month from 12:00 to 1:00 pm. Please refer to our event calendar for location. The Houston West Chamber of Commerce provides a variety of Membership options to fit your business needs and goals! View the various options below. Ready to sign up? Click here to apply for Membership online! The Houston West Chamber of Commerce is a 501 (c) 6 Membership Organizations. Contributions to section 501(c)(6) organizations are not deductible as charitable contributions on the donor’s federal income tax return. They may be deductible as trade or business expenses if ordinary and necessary in the conduct of the taxpayer’s business. Please consult your tax advisor. When Is The Monthly Meeting? The Houston West Chamber has numerous monthly events. This is a great way for new and prospective members to learn about the Chamber, meet other members, and learn how to make the most of membership. Really learn how to grant your business wishes. Orientation is the first Wednesday of each month from 12:00 – 1:00 pm at various locations. Please refer to our event calendar for location. Some months lunch is provided by a sponsor, and some months you bring your own lunch! Please check our calendar and weekly email blasts for details. Covering a variety of business topics ranging from marketing to finance, this monthly seminar series offers members the opportunity to increase their business know-how with a different speaker each month. Coffee Talk is every first Thursday of the month from 7:45 – 9:00 am. Please refer to our event calendar for location. Interested in participating as a speaker? Click here to complete the application. Focused on truly successful networking and netweaving, this is perfect for anyone who is not yet an expert at it. Meet, mix, and mingle in the morning. Meets the third Wednesday of each month from 7:00 – 8:30 am at Cantina Laredo. Please check our calendar for program, location details, and updates each month. Click Here for Sponsorship Opportunities. Kick start your morning with this power networking session! Meets the fourth Tuesday of each month from 7:00 – 8:30 am at Berryhill Baja Grill – Buffalo Speedway. Please check our calendar for program, location details and updates each month. Click Here for Sponsorship Opportunities. Here’s your chance to rub elbows with some of the most influential people in Houston and expand your visibility and “be seen.” Anywhere from 80 to 600 people typically attend each Chamber luncheon, which is held on the third Thursday or Friday of each month. Networking is from 11:00 am to 12:00 pm; program and luncheon until 1:00 pm. The location and details will vary by month. Check the calendar for the next Chamber luncheon. This laid-back monthly event allows members and guests to mingle and network over cocktails and appetizers. The event sponsor provides the location, food and beverages, and gets to make a short presentation. Socials are typically held the third Thursday of the month from 4:30 to 7:30 pm, but vary by month. If you are interested in sponsoring a social, please contact the Chamber Office. Ambassadors Committee (By invitation only): Second Tuesday of each month from 11:30 am to 1:00 pm at varying locations. Business & Education Partnership Committee: First Thursday of each month from 8:00 to 9:30 am at varying locations. Business Resource Committee: Second Wednesday of each month from 7:30 to 9:00 am at varying locations. Business Golf Classic: Second Wednesday of each month (August - April) from 12:00 to 1:00 pm at the Office Evolution, 1300 W Sam Houston Pkwy #100. Governmental Affairs: Please refer to our monthly calendar. Salute to Veterans Committee: Second Wednesday of each month from 11:30 am to 1:00 pm at varying locations. Suited Connections Committee: First Tuesday of each month 11:30 am to 1:00 pm at varying locations. West Houston Economic Development Summit: Third Wednesday of each month from 11:30 am to 1:00 pm at varying locations. Women Driving Business: Various days and locations between June and December. Please check our calendar for any updates concerning any of the committee meetings or events. How Do I Know If This Is The Right Networking Community For Me And My Business? If you are considering membership, try us out before joining. 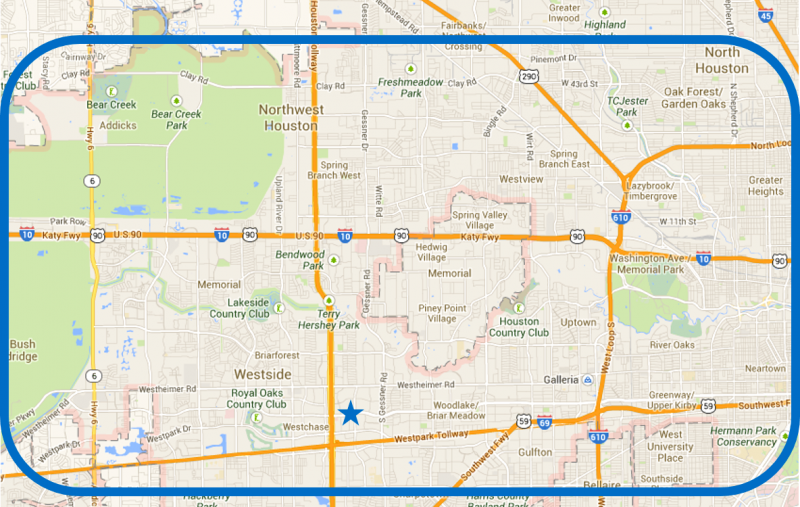 There are over 50 Chambers of Commerce in the greater Houston area and each has a different atmosphere. The Houston West Chamber focuses on business-to-business relationships. You may attend any three events of your choice as a prospective member. After that, we strongly encourage you to make an investment in our community to receive the full benefits of our organization. Choose either a committee meeting to try out, a luncheon or a social! Although the Houston West Chamber has set boundaries, many businesses outside of this region have chosen to join the organization for our business-to-business relationship opportunities. Neighborhoods covered include: Bear Creek, Alief, Memorial, Energy Corridor, Westchase, Spring Branch, Uptown, and Greenway Plaza. Boundaries - Serving Houston from Greenway Plaza to Energy Corridor! Here are the recommended steps. Step 1: You may join after your three prospective member visits or now by clicking the "Join Now" button found on the homepage. Step 2: Come to Orientation on the first Wednesday of each month from 12:00 to 1:00. Please check our calendar for program, location details and updates each month. Step 3: Plan out a schedule of networking and advertising for the year. Step 4: Choose a committee to get involved with! Step 5: Begin to review event sponsorships to find where you can spotlight your organization OR schedule a meeting with our staff to discuss individually-tailored opportunities. Networking is the main key to building your business in any community. We strongly recommend that you attend at least one event each month to build relationships with other members. If you are unable to participate or only able to attend one event each month, there are still great Corporate Visibility benefits to being a member. With your membership, you receive an online directory listing on our site. Our members are encouraged to use other members to meet their consumer and B2B needs. This listing will increase your visibility, credibility, and boost your business! By joining the Chamber's online directory, you will be able to increase traffic to your own website and your own business. All members also receive a listing in our annual print Directory & Resource Guide, helping further highlight their membership. You are also able to post articles, member to member offers, job openings, and press releases to the website through your Chamber Master member portal. If you have a special or a change in your business, we recommend posting this to our website. This is free to members! The Chamber offers numerous advertising opportunities from blast e-mails to our database to providing event attendees with a promotional item. Contact our staff for details at 713-785-4922. Some of our members have found events sponsorship to be an easy way to brand their business even if they cannot participate by attending. Please contact the office for details on your numerous sponsorship opportunities at 713-785-4922. Building relationships with other members is the main key to your success in building your business. People give to people! If you are on a committee and attend events, others are able to get to know you as a person. The idea is simple: If you give me business, I will send business your way! It works every time. Do you have a product or service that you can donate or showcase to other members at no cost? One of our most successful members has compensated numerous hours of service to members. When another business sees the quality and dependability in your company or organization, they are more likely to use and refer you. By marketing in our email and social media platforms and handing out promotional items, you can build brand recognition that will be tied to your name. Once other members see you as a reliable source and know what you do, they are more than happy to refer you as a preferred vendor. How Do I Edit My Website Listing? Only the Primary Representative of each company has the ability to change the organizational information on the website. If you do not know who your Primary Representative is, please call the chamber at 713-785-4922 and we will gladly assist you. Log in to the HWCOC website on the top left corner. Click on "Company" to view drop down menu. To edit the Chamber's database entry, click "Organization Information". This should only be for major changes in contact information. To edit what information gets listed in the Directory, click "Website Information". Uncheck the "Use Organization Information" box at the top of that section to enable editing. Make the necessary changes to the contact information. How Do I Add An Article, Job Listing, Or Special Offer To The Website? Only the Primary Representative of each company has the capability to add an article, job listing or special offer to the HWCOC website. If you do not know who your Primary Representative is, please call the Chamber at 713-785-4922 and we will gladly assist you. In the Home tab, click on the content you would like to create (such as "Hot Deals" or "News Releases"). Click on the button below the heading that says "Add". Complete the form fields as needed. Enter the dates during which you would like to maintain the content active. Click the "Submit" button - after a staff member approves your content, this will show up on the website. How Do I RSVP For An Event If Online Registration Is Closed? Please contact the office at 713-785-4922 to find out if registration will be available at the event. NOTE: Registration may be closed due to reaching max number of attendees thus, attendance cannot be guaranteed after online registration stops. Who Do I Refer Billing Questions To? Please contact our billing coordinator at billing@hwcoc.org or 713-785-4922. Full refunds less a 10% processing fee will be issued for registration cancellations made a MINIMUM of 3 business days (during normal business hours) prior to an event, regardless of attendance. After this time, reservations have been guaranteed to the facility/caterer and we will be unable to provide a refund. The refund request must be in writing and sent via fax to (713) 785-4944 or emailed to billing@hwcoc.org. PLEASE NOTE: No refunds will be made over the phone. Refunds will be issued after the conclusion of the respective event. If HWCOC cancels an event due to bad weather conditions, a full refund will be given or fees will be applied towards a rescheduled date. If HWCOC cancels an event due to lack of sales, a full refund will be given. Sponsorships and tickets for any Major/Featured Fundraising Event, as designated by the Houston West Chamber of Commerce, are non-refundable and non-transferrable (regardless of attendance). No refunds will be given. Major/Featured Events include but are not limited to: West Houston Economic Development Summit, Business & Education Partnership Awards, Health & Medical Luncheon, Salute to Veterans Luncheon, Women Driving Business series, Women's Excellence in Business series, and Zest in the West. Golf Tournaments can only be called off by the hosting golf course. In the case of a rainout or cancellation due to inclement weather every attempt will be made to reschedule, with the date to be decided by the hosting golf course. However, if this fails, your registration will be considered a donation to the Houston West Chamber of Commerce. No refunds will be made over the phone. For companies choosing the monthly credit card payment option, membership will automatically renew at the end of 12 months and monthly billing will continue until the chamber is notified in writing to discontinue via fax at 713-785-4944 or email at billing@hwcoc.org. Primary representatives, the contact listed in the membership application, will receive a request to create their individial login credentials for the website to access the Membership Dashboard and Portal. If you have not received an email with a link to create your login, contact the Chamber Office at 713-785-4922 or email info@hwcoc.org. If you are an additional representative for your organization, you will need to be added under the member profile by the designated primary representative in order to receive a link to create your individual login. Log in to the HWCOC website by clicking the link in the top left corner. Under the "Personal" menu heading, click "Username/Password". Click "Change" next to the item you wish to change. Enter the new login credentials you wish to use. What Method Of Payment Do I Use For An Event? At the request of our membership, we are working hard to keep our overhead costs low and staff time productive. Your kind assistance by registering and paying online for ALL EVENTS helps make this possible. However, for those interested, we can retain your credit card information on file. *An additional $5.00 charge will be added for each manual transaction. Sponsorships can be paid by credit card, check, or cash at least three weeks prior to the event. Please see individual event details for more information. Why Is My Name Not Listed In The Member Directory? At the request of our membership, the Houston West Chamber has decided not to list primary contact information for your business in our Membership Directory. We would like to prevent unnecessary sales calls directed to your business, so we have opted to not include personal contact information. However, if you would like to list your name, you have the option of opting to be listed online. What Is Included In A Business Builder Membership? If My Company Is A Member, Does That Mean I Am A Member Too? When a company becomes a Chamber member, all employees of that company's branch/office that joined are considered Chamber members and have full access to our programs and benefits. How Can The Chamber Help Me Build My Professional Skills? The Chamber offers a variety of programs, seminars, and workshops to help you develop the skills you need to excel in business. Those offerings range from the West Houston Leadership Institute program to monthly events (Coffee Talk, Business Wellness Lunch & Learn, Business Growth Workshop, SEO411 Online Marketing Seminar) and much more. See our events calendar for the latest event offerings. How Can I Help Shape And Support The Chamber's Programs? The Chamber's event programming is decided and coordinated by our members for our members. Members that volunteer on committees plan, fundraise, and execute monthly and annual events. By providing time, dedication, resources, and ideas committee members ensure that the Chamber can provide quality programming for all member organizations. In addition to giving you the opportunity to give back to the Chamber, committee participation provides a way to build stronger long-term relationships with your fellow members as you work towards a common goal on a monthly basis! All active Chamber members are invited to participate in committees and we encourage you to visit groups that appeal to you and your business goals. If after visiting the meeting, you would like to become a part of the committee, contact the staff liaison to receive committee criteria for review. Depending on the committee, this can include time commitment and fundraising goals. Once you have reviewed and agreed to the committee criteria, you will be added to the roster for the committee. You must attend at least three consecutive meetings to be considered an active member of the committee. Click here for a full listing of Chamber committees.